Avobenzone (3%), Homosalate (6%), Octinoxate (7.5%), Octisalate (5%), Zinc Oxide (2.5%). Water, Aloe Barbadensis (Aloe Vera) Leaf Juice, Helianthus Annuus (Sunflower) Seed Oil, Polysorbate 20, Dimethicone, Cetearyl Olivate, Sorbitan Olivate, Glycerin, Glycol Stearate, Acrylates Copolymer, Carthamus Tinctorius (Safflower) Oleosomes, Cetyl Alcohol, Stearyl Alcohol, Sarcharide Isomerate, Camellia Sinensis (Green Tea) Leaf Extract, Glycrrhiza Glabra (Licorice) Extract, Cucumis Sativus (Cucumber) Fruit Extract, Acetyl Hexapeptide 8, Alpha Lipoic Acid, Ascorbyl Palmitate (Vitamin C), Sodium Hyaluronate, Ethyhexylglycerin, Phenoxyethanol, Lavandula Angustifolia (Lavender) Flower Oil, Lecithin. This whole line, from shampoo to sunscreen, is awesome. Natural ingredients that sooth and calm, while not breaking you out. 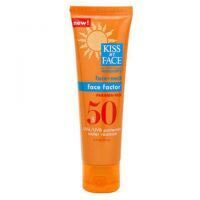 This particular product is great because it doesn't use harsh SPF ingredients (avobenzone, etc) and does protect your sensitive skin None - this whole line is great This is NOT an acne treatment, but it is a sunscreen to protect your sensitive, acne prone skin. It works, it is natural, and it doesn't break your skin out. I also love their face wash, and underage moisturizer as well. I still use Dan's AHA moisturizer at night (completely cleared my skin! ), but I use this product to wash, and moisturize during the day, as well as their sunscreens and shampoo and conditioner. I used to have moderate-severe acne, it was hormonal as well as seasonal. Dan's AHA lotion was my savior, that and switching off any harsh cleansers and lotions (peroxides, etc). Once my acne cleared up I started experimenting with these products, and they never made my acne came back, but I didn't use them when I had acne. What I do know is they dont cause breakouts, but I dont know what they do with current breakouts.